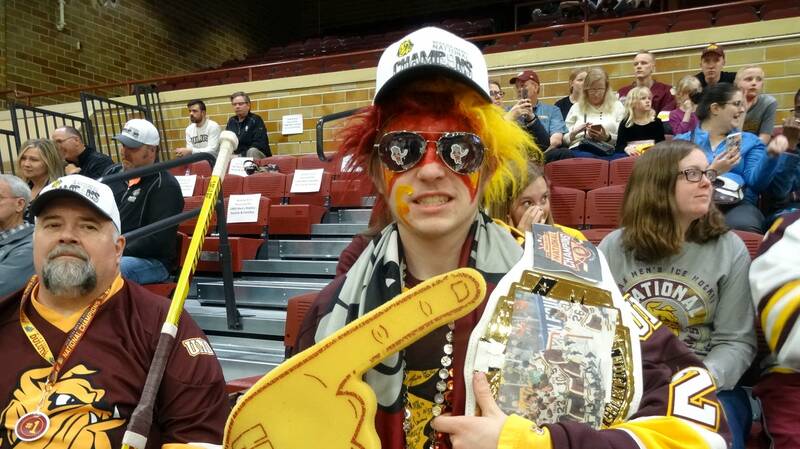 Young and old started showing up an hour early Tuesday night at the Romano Gymnasium on the University of Minnesota Duluth campus to get a glimpse of the NCAA hockey champions two years running. Soren Hanhan, 11, came decked out in a Bulldogs jersey. "It's pretty cool to have a city that's actually good at hockey and sports, and that they won back to back is just crazy," he said. 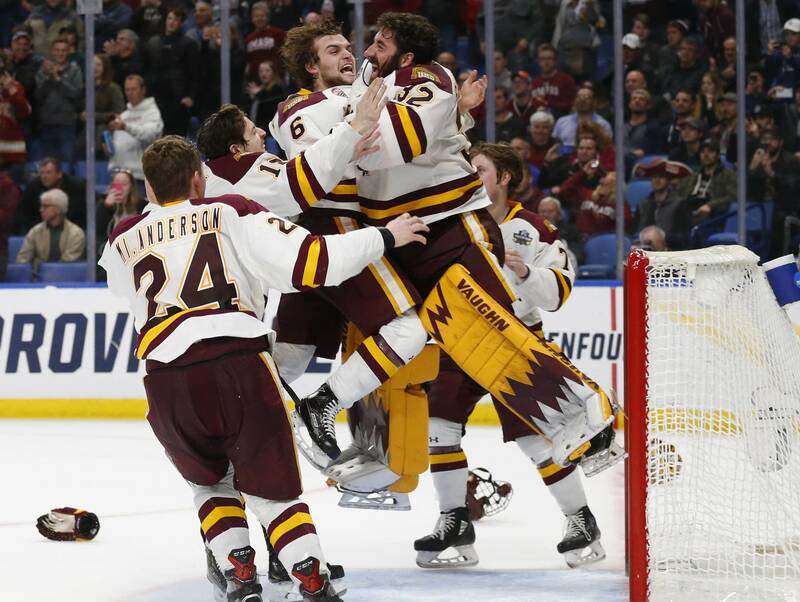 The UMD Bulldogs captured their second consecutive NCAA men's Division 1 hockey title Saturday with a 3-0 victory over the University of Massachusetts. 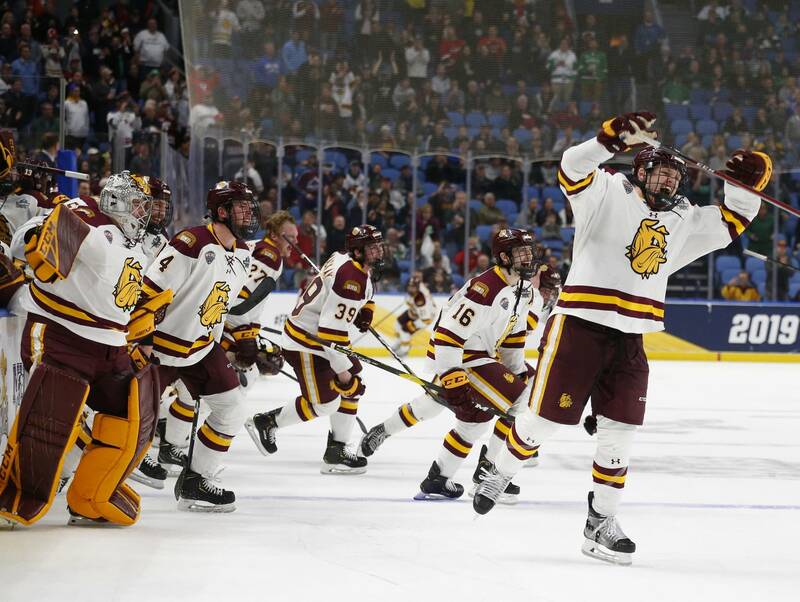 Tuesday night the Bulldogs celebrated their victory back home in Duluth. 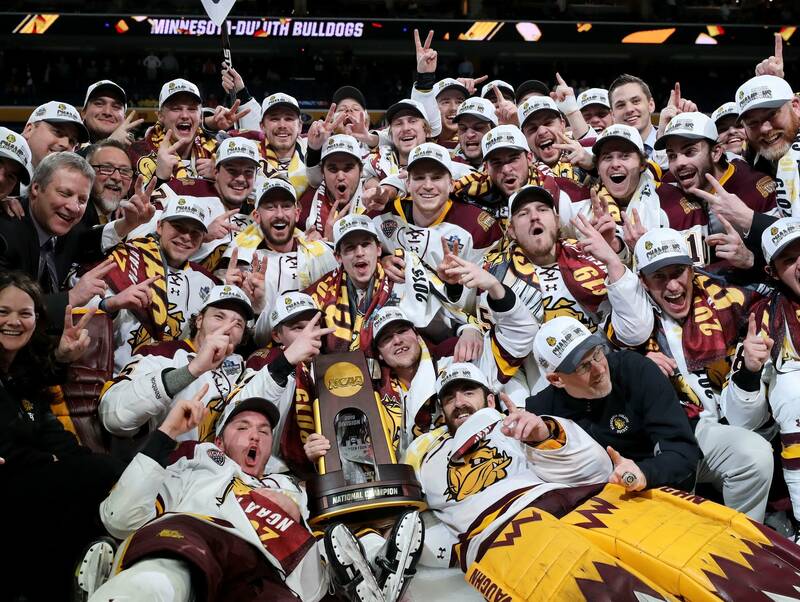 UMD has built a powerhouse program in recent years, with four national title game appearances — three of them in the past three years — and three titles in the past decade, more than any other college program. The team has been embraced by a hockey-crazed town, where kids still play on outdoor rinks their parents flood with hoses on subzero nights. "For one we're big fans of the Bulldogs, we've got season tickets, go to all the games," said Duluth resident Kevin Chick. "The kids are absolutely obsessed." Chick's 7-year-old son, Cooper, plays hockey outside on the neighborhood rink, and inside in his basement. "These kids all think that they can become a UMD Bulldog, and that's all that they want," Chick said. 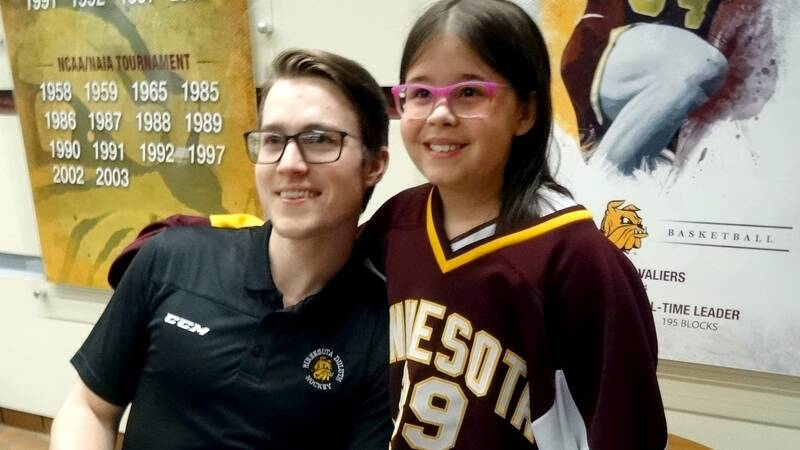 "So to be able to show them the success from UMD, a small-town local college at a national level, I think really inspires the kids to do their best." 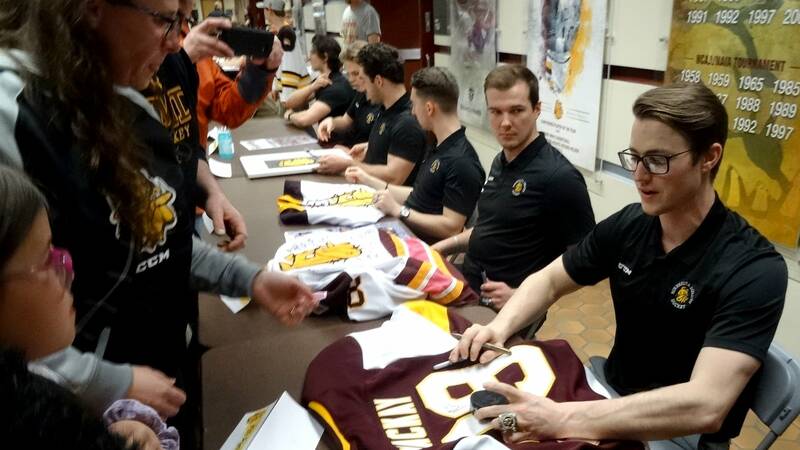 Chick and others in the crowd say UMD hockey, playing games on national television, has helped put Duluth on the national map. 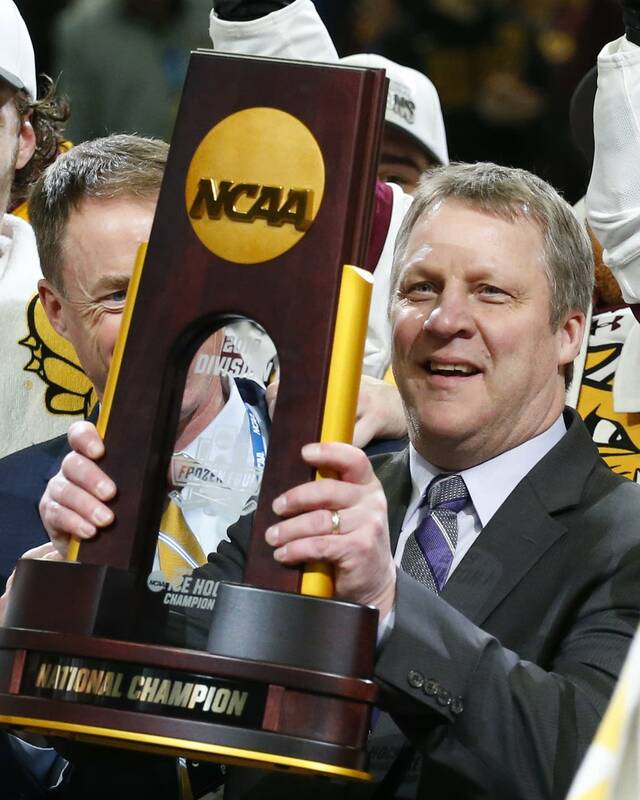 While the city has a rich hockey history — NHL superstar Brett Hull was a Bulldog in the '80s — for years UMD was largely overshadowed by traditional college hockey powers like the University of Minnesota or the University of North Dakota. But in the last decade, athletic director Josh Berlo told the crowd Tuesday night, the tables have turned: "No team has more Frozen Fours. No team has more national championships. Not North Dakota. Not Michigan. Not Boston College. Not the Minnesota Gophers. Bulldog Hockey did that." Still, head coach Scott Sandelin said he doesn't want to hear the word dynasty. "I think that's something you look at down the road," he said. "Right now, we've been fortunate to get to that spot and win. I've had great players, and it's very hard to do, so I think the biggest thing is you never take it for granted, and you appreciate when you get those opportunities." 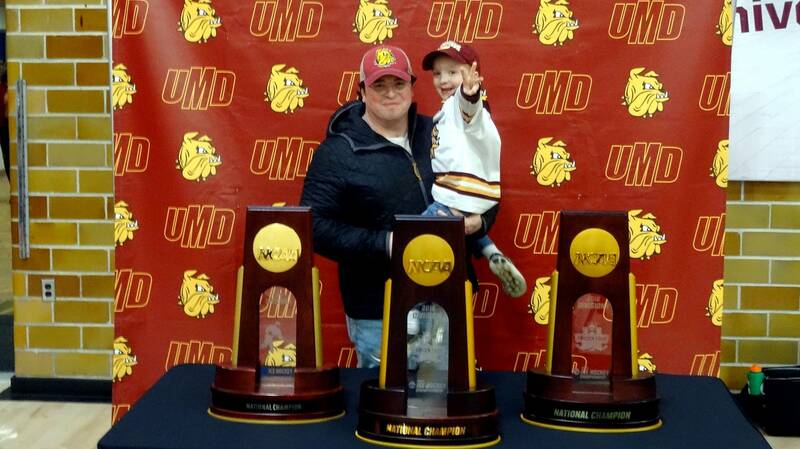 Next year will be Sandelin's 20th as head hockey coach at UMD. In his first year, the Hibbing native only won seven games. Next year, he'll try to become the first coach in more than 60 years to win three national titles in a row. Correction (April 18, 2019): A photo caption in this story incorrectly identified Gino Pillsbury. The caption has been updated.